If you try to install or upgrade several computers at once, you will soon discover that manual installation is a huge time sink. Even if you are working with a checklist, it is often difficult to get everything installed the same way every time. For this reason, most systems administrators understand the importance of an automated install system. It's no surprise that virtually every operating system has the ability to automate installations. What is curious, given the necessity of such systems, is that configuring automated installation typically requires so much time and effort. In the past, automated installation required a fair amount of knowledge about networking, Pre-eXecutable Environment (PXE), and, of course, the operating system itself. Those prerequisites represented a significant barrier to entry. 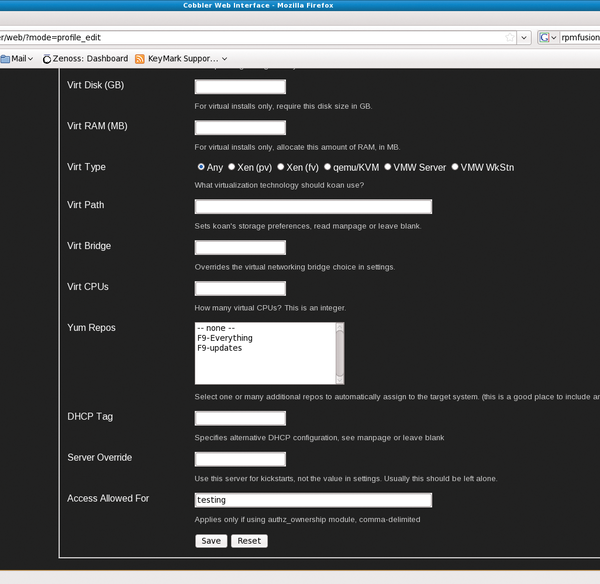 Automated provisioning techniques have taken a number of forms over the years. The approach familiar to most people is taking a disk image of a system with the use of dd, PING (Partimage is not Ghost) , or another tool, then deploying that disk image anytime you need it. Unfortunately, this solution doesn't scale well because it relies on a uniform environment and does not take into account differences in hardware or function. Also, the image gets out of date over time – with the constant appearance of updates, managing the images can become a full-time job. The more robust way of provisioning is by automatically installing the operating system each time, rather than relying on a predefined disk image. This method is generally considered more challenging. The Cobbler project , born at Red Hat and lead by Michael DeHaan, significantly lowers the barrier for provisioning in Linux. Cobbler is an all-encompassing framework for automated provisioning systems that provides a "soup-to-nuts" solution, bringing together provisioning prerequisites like DHCP and TFTP, providing management utilities for controlling software repositories, and offering up a framework to enable both a command-line and web interface for easy management (Figure 1). Figure 1: Cobbler comes with an optional web-based interface. In addition to handling hardware-based installs, Cobbler is proficient at configuring virtual machines: You can provision a collection of Xen or KVM virtual machines as easily as a new hardware-based server or workstation. In this article, I show you how to set up a Cobbler provisioning system and take a look at the provisioning of virtual machines with Cobbler's helper application Koan. By managing all the configurations for all services, Cobbler literally can run an entire provisioning network from a single box. Of course, you don't have to use Cobbler to configure all these services because you can easily use existing DNS and DHCP servers if they are already present. 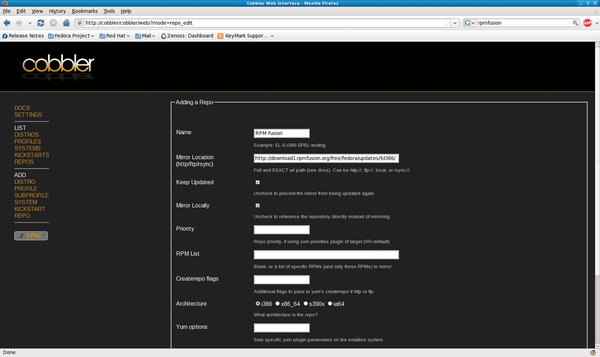 In the event they aren't, you can use Cobbler to manage the daemons and their configurations. Aside from letting you manage daemons, Cobbler provides a framework to mirror the installation framework from a DVD or an Internet repository. 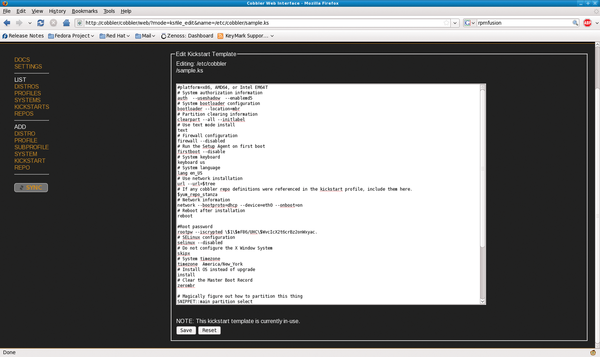 Additionally, Cobbler can mirror and keep current with third-party repositories. In the event that PXE booting isn't an option, Cobbler can also generate a bootable ISO that will present the user with the same installation options that are presented to a machine that uses PXE. A single Cobbler command will download an operating system from the Internet or optical media, configure Syslinux, and make the system ready for deployment. Another command grabs all of the packages from an update repository. Most discussions of Cobbler focus on its ease of use, but equally important is its power and flexibility. For instance, Cobbler allows you to use snippets of code across many configuration files. If a snippet of code needs to be in multiple Kickstart files, you can place it in one file. The classic use for this feature is with SSH keys. No one wants to manually push an SSH key to each host. Rather than being limited to simple includes, Cobbler has the power to dynamically insert code snippets so you can programmatically change the configuration on the basis of the type of machine, function of machine, IP address, or a host of other factors. This approach allows you to have a single Kickstart file with embedded logic that deploys different sets of packages and pushes differing configuration files based on that logic. For example, Cobbler allows you to push an SSH key up programmatically, so your development machines might get one set of SSH keys and your mail servers get a different set. This example is just a simple demonstration of the type of flexibility that Cobbler has built in. Another feature that is getting a lot of attention is Cobbler's integration with configuration management systems such as Puppet. Although packages are available for Cobbler in Debian and Ubuntu, they are still very much in development. At the time of this writing, a machine with Fedora 8 or 9 or with RHEL/CentOS 4 or 5 would be a better candidate for Cobbler. Once the operating system is installed, you can set up Cobbler and its dependencies. For the remainder of this article, I'll assume you plan to use Cobbler as an all-in-one provisioning system and that it will be managing DHCP and DNS. If you use an address other than 192.168.1.5, modify /etc/cobbler/dhcp.template appropriately to match the network you have chosen. If you don't do this, machines will unsuccessfully attempt to PXE boot to the 192.168.1.5 address, and machines booted with a Cobbler-generated network install ISO will vainly attempt to reach installation repositories on 192.168.1.5. 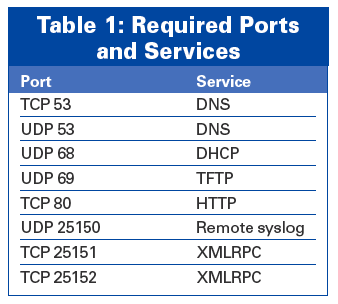 If you are using a firewall, make sure you open the ports shown in Table 1. What if I Don't Have Control of DHCP? Now it is time to import the first distribution. Cobbler makes this an easy, one-command step, with only two arguments: the name you assign to the distribution and the location of the installation data. The installation files can be pulled from install media or from the Internet. One of the interesting features of Cobbler is that it provisions systems dynamically based on the latest packages. This means that if Cobbler knows about an update repository, it will install the latest updated packages in that repository. This can save lots of time by eliminating post-install updates, particularly if it has been a long while since the distribution was released. Also, you are not limited to update repositories; you could just as easily use a repository for Dell's OpenManage or HP's System Management packages or some other third-party repository. With a repository defined by the preceding command, the actual content is synced from the mirror to the local Cobbler server with the following command. Note that I listed sample.ks as the Kickstart file. That particular file will install a minimal system. It is a good idea to add some packages and possibly make some configuration changes in the Kickstart file. This sample.ks is a good base to start with, though because it certainly has the minimum requirements, and you can add from there. At this point, Cobbler should return the results (Listing 1). Problem numbers 0 and 1 (service cobblerd is not running and service httpd is not running, respectively) will be rectified shortly. Problem number 2 (since iptables may be running, ensure 69, 80, 25150, and 25151 are unblocked) will throw an alert if iptables is running, so as long as the ports listed above are opened, this problem can be ignored. Problem number 3 (One or more kickstart templates references default password 'cobbler' and should be changed for security reasons) will show up because all of the sample Kickstarts have a root password that is cobbler. This situation is only a problem if those Kickstarts are to be used. The root password in each of those files can be changed easily. Because I assume that a user-created Kickstart file will be used, wherein a unique root password will be set, you can disregard this problem as well. Figure 2: Editing a Kickstart template. From within the web interface, system administrators can add, modify, and delete distributions, repositories, and profiles. At this point, you can PXE boot or boot to a Cobbler-generated network install ISO and begin a network install that's completely automated. Burning and booting the created ISO file will present the user with the same options and experience as if you had used PXE. The resultant CD already has the connection information to point back to Cobbler and the list of available profiles. Figure 3: A profile associates a distribution with a Kickstart file and other settings. Figure 4: The full range of profile options offers a flexible framework for customizing the virtual system. What if I Use a Non--RH-like Distro? It's no surprise that Cobbler is great at deploying Red Hat and Fedora; after all, Cobbler's primary author, Michael DeHaan, is a Red Hat employee and Fedora contributor, and Cobbler originated (and still lives) within Red Hat's Emerging Technologies division. However, Cobbler will also install SUSE and Debian-based distributions. Some of the other interesting options that are already available include PXE booting any Live CD and updating firmware for network hardware from HP and Dell. As of this writing, development work is occurring to provide provisioning of Windows, Solaris, and hard drive images that are operating system agnostic. For those who don't want to use Fedora or RHEL for their provisioning system, Debian and Ubuntu community members are working to get it packaged and functional for Debian-based distributions. 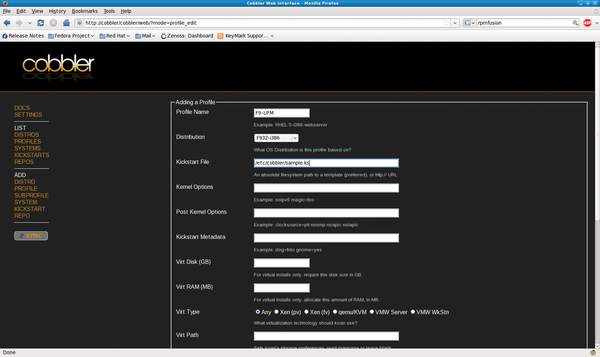 Koan, Cobbler's client-side helper application, makes it easy to deploy virtual machines. With a Cobbler server in place, you can use Koan to configure your virtual disk, network, and other functions automatically; load the OS automatically; and start the virtual machine. Moreover, Koan works with Xen, KVM, and certain versions of VMware. The preceding command will contact Cobbler to determine the amount of RAM and disk space, write the configuration file, start the virtual machine, and install the operating system. Sometimes, you might want to change default values such as the amount of memory. 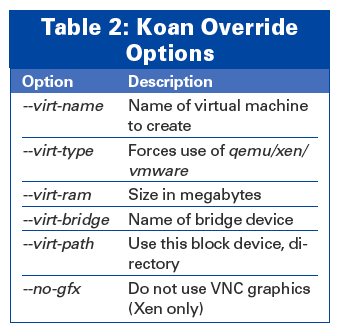 Table 2 shows some override options available to Koan. One cautionary note: VMware requires that the MAC address of the virtual machine be between 00:50:56:00:00:00 and 00:50:56:3F:FF:FF for networking to function properly.